The Chicago Bears made their first signing of the 2003 free agent period on February 28th, inking tight end Desmond Clark to a six year deal worth a reported $9 million. Clark was a sixth-round pick of the Denver Broncos in 1999 and had his best year as a pro in 2000. That year, he caught 51 passes for 566 yards and six touchdowns. He was injured in 2001 and only had two receptions with the Miami Dolphins in 2002. When this newest Bear suits up for his first practices in May, he will inevitably be asked the question by the media and fans alike-will the jinx stop with him? From Greg Latta to John Gilmore, the Bears have been searching for a tight end since Mike Ditka redefined the position in the 1960's. Many Desmond Clarks have been signed, but none of them have enjoyed success in Chicago. From Mike Cobb's lung ailment in 1980 to Chris Gedney's bout with colitis to just plain not living up to expectations, there seemingly has been a hex on the players that have filled this position in Chicago since Iron Mike was attending all-star games during the Vietnam war. Perhaps Clark doesn't know it, but the average tenure for a Bears tight end that has made the roster since 1977 has been 3.07 years. This walk through Chicago's tight end turnstile starts in 1979. The Bears' tight ends that year were Mike Cobb and Greg Latta. 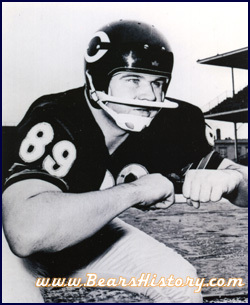 Most teams carry three tight ends on their roster, but since his arrival in 1972, 6' 5" punter Bob Parsons served as the team's third tight end (and fourth quarterback). That year, Cobb started each game in which the team opened with a TE on the field, and Latta started two others. Both Cobb and Latta played instrumental roles in the 28-27 Bear victory at San Francisco on October 28th. All that glittered on that fall day in 49er territory would not last for these two, however. The following season, 1980, would see Cobb's career end after a hospitalization for pleurisy, and Latta missed the season after breaking his hand in August. Due to the injuries and illnesses befalling the aforementioned two, FB Robin Earl, then #39, was moved to TE and switched his uniform number to 81. Earl filled the position in a workman-like fashion until 1982. Bob Fisher also played in 1980 and '81. Fisher was declared a "steal" in the 12th round in 1980, and caught two critical touchdown passes that season. That didn't stop his exit from the club after two short seasons. 1982-1985 brought forgettable performances from the trio of Jay Saldi, Pat Dunsmore, and Mitch Krenk. Maybe the only memorable play from the three was Dunsmore's catch of a Walter Payton pass in Chicago's playoff upset of Washington in 1984. 1981-88 however, was filled by one of two remarkable TE's in this two decades of frustration at the position for Chicago. Emery Moorehead was obtained by the Bears in a roundabout fashion on October 21, 1981, after being signed then waived by the team in August of that year. Moorehead was drafted by the New York Giants in 1977, then traded to Denver in 1980 before being waived the following year. Moorehead originally played wide receiver and wore number 43, and made his first impact just a month after his signing with a 56-yard overtime kickoff return that sparked a Bears' victory. Moorehead started every game in 1982, 83, and 85-87, leading the team in receiving yards in '82 and scoring the most touchdowns (5) by a tight end since Iron Mike. Perhaps Moorehead's most memorable moment came in 1986 against Atlanta, when he hauled in a Mike Tomczak pass and took it 85 yards to the Falcon 1. It was the longest play in the NFC that year. Tim Wrightman teamed with Moorehead during 1985 and '86 and became another two-year player at the position. Wrightman was originally drafted by Chicago in 1982 but didn't play with the team until the Super Bowl season. Moorehead remains one of the three solid Bear TE's that played the position during this 24-year period. In his tenure with the team, which lasted through the 1988 season, he caught 200 passes for 2730 yards and 14 touchdowns. Prior to the 2002 season this ranked him 17th on the Bears' all-time receiving list. In 1987 and '88, Chicago tried once again to look to the future at the position, picking up free agent Cap Boso from Illinois in '87 and drafting Cal's James "Robocop" Thornton in the fourth round in '88. Moorehead mentored for that final season in '88 until Boso, Thornton and '89 free agent James Coley took over. Boso and Thornton perhaps should be remembered as players with promise that started strong but lost steam to injuries all too soon. Boso had a great 1987, catching 17 passes for an 11-yard average with two touchdowns. Boso played in six games in '88, caught another 17 passes and a TD in '89, and started his first and only game in 1990. By 1991, the 28-year-old Boso's body was breaking down, with a clicking, arthritic left knee, a bad ankle, and pinched nerves in both shoulders, as described by Armen Keteyian in Ditka, Monster of the Midway. Though his career was almost over, what Bear fan will ever forget Boso's reception against the New York Jets in overtime in 1991, when he jumped up with a face full of grass in his facemask at the goal line. Thornton started 57 straight games from 1988-1991, then missed the entire 1992 season with injuries before a short stint to end his career with the NY Jets. Coley may only be recalled for his five daughters' names: Tiyonneteona, Shanuanevia, Ani, Myrialysia and Fehlisegwanafay. After Boso's career ended midway through 1991, Chicago picked up its next stalwart at the position. Keith Jennings was a fifth-round pick by Dallas in 1989, and acquired by the Bears in October 1991. Jennings, nicknamed "Godzooki" by WSCR in Chicago, started 3 games in '91 while appearing in 10. In 1992 the Bears again dipped into the draft, selecting Todd Harrison in the fifth round and picking up free agent Kelly Blackwell. Harrison didn't make the team; Blackwell played for one season. The following year Wanny came to town, bringing along with him his new San Francisco/Dallas hybrid offense with the need for pass-catching tight ends. Wannestedt had a penchant for naming his draftees after players he'd previously coached, and declared 1993 third-round pick Chris Gedney to be in the Jay Novacek mold. Gedney made the catch of the year in 1994 against Buffalo, diving across the end line for a one-handed touchdown, but spent most of 1993 and '94 on the sideline or injured reserve. He played through 1995, but only as the holder for FG attempts as he was battling a strong case of ulcerative colitis. He was signed by Arizona in 1996, where he currently plays today. Jennings, cut briefly in 1994 and re-signed later that year, started the better part of nine years with the team and scored six touchdowns in 1995. Wannstedt's most dependable tight end turned out to be reserve Ryan Wetnight, who played for Chicago from 1993-1999 and scored nine touchdowns. The most curious Bears career among all these players must be Marv Cook, a one-year wonder. Cook was drafted by New England on the third round in 1989, played in 80 games for that club from '89-'93, and made the Pro Bowl in '91 and '92. His luck ran out when he became a Chicago tight end, as he caught 21 passes and one touchdown and struggled with a back injury. Cook was cut after playing only one season on a three-year contract in Chicago, and spent the following season in St. Louis. 1996-a season filled with injuries-found the Bears fielding an injured Jennings and Wetnight, then rookies Kerry Cash and Bobby Neeley. The team even experimented with moving FB Mike Faulkerson-Delaney to TE, but regardless the season was a loss at the position. Determined to improve once again, they drafted USC star John Allred with their first pick in 1997, attempting to make up for the fact that their first pick could have been used on future hall-of-famer Tony Gonzalez. Instead, they traded it for Rick Mirer. In 1998, the Bears thought they landed the steal of the draft when they nabbed Oklahoma State TE Alonzo Mayes in the fourth round. Mayes' stock had slipped mightily when he tested positive for marijuana at the NFL combine. Mayes claimed the test was the result of second hand smoke, held out through the first month of training camp for first-round money, and delivered the quote of this story when he finally reported. Upon finally agreeing to terms at fourth-round money, Mayes took a whole day to fly from Oklahoma to Bears' camp at Platteville, WI. It turned out that he had been late for and missed two separate flights, and when asked by the media what happened, he responded that "Sometimes it just aint' yo day." Mayes never became the answer and was traded back to Wannestedt at Miami for a seventh-round pick in 2000. Allred was also allowed to leave via free agency after that season. Kaseem Sincino made a brief appearance that year following the Mayes trade, but spent 2001 on injured reserve and departed thereafter. In the 2000 draft, Mark Hatley bypassed Michigan TE Aaron Shea (a native of Ottawa, IL) and instead took Wake Forest LB Dustin Lyman and converted him to the position. Veteran free agents Fred Baxter and John Davis were brought in before the 2001 campaign. Lyman didn't see significant action until Chicago's game in Green Bay in 2002, during which he caught seven passes and scored two touchdowns. But as fate normally treats Bear tight ends, Lyman injured his knee and was lost for the season in that same game. Baxter was cut mid-season for criticizing Chicago's playcalling, and Davis and Lyman have signed new two and three-year deals. Barring a draft pick being added to the mix, Davis, Lyman and Clark will fill out the roster at the position. So Chicago fans anticipate the 2003 season, during which it will be revealed whether or not this position remains a curse or becomes a blessing. One is left to wonder why the team bothered to sign Clark to a six-year deal. If history is any indication, he won't be in Chicago past year three. "Somtimes, it just aint' yo' day." -Bears rookie tight end Alonzo Mayes the day he reported to Platteville training camp in August 1998. Mayes held out of camp, arguing that he should be paid as a first-rounder even though he was picked in the fourth. He made this statement after he missed two different flights to get to Wisconsin. Good information on Ditka's tight end career in the above books. Ditka remains the only legendary Bears tight end. Desmond Clark was signed in 2003 as the answer to the Bears' problems at the position, but he has yet to emerge as the threat he was hoped to be. Remarkably, he was voted third alternate to the Pro Bowl at his position in 2005. Emery Moorehead's son Aaron is currently a wide receiver for the Indianapolis Colts (2005). If Ron Turner's offense were able to find a weapon even of Keith Jennings' caliber, it would help to open up his offense as it was in 1995. Following Jennings' six touchdown season in '95, Bears tight ends have been an invisible group in the receiving game.